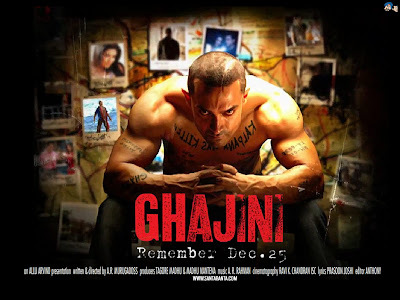 Sanjay Singhania (Aamir Khan), is a rich businessman who owns a cellular phone company . Kalpana (Asin Thottumkal), an advertisement model goes around telling her advertisement crew that she is the love interest of Sanjay, in spite of her having never met him and also goes to the extent of giving an interview about her relationship to a popular magazine. Sanjay happens to hear about this through the media and wants to settle scores with her. On his way, he catches a fleeting glimpse of a young woman (who happens to be Kalpana) helping handicapped children cross a street. It is love at first sight for Sanjay. He moves on to confront Kalpana at her advertisement studio. He is pleasantly surprised to realize that she is the same helpful woman he saw a while ago. He chooses to hide the fact from her that he is Sanjay, calling himself as Manohar. Kalpana eventually falls in love with him. Once, while on a train to Mumbai, Kalpana saves a group of young girls from abuse by a group of goons led by Lakshman (Pradeep Rawat). After a few days, the same goons come to Kalpana's house in order to avenge their embarrassment. Incidentally, Sanjay arrives at the scene and fights off the goons, but during the ensuing fight, Kalpana is murdered. The irony showcased is that Kalpana never finds out that he is Sanjay. Lakshman then strikes the downcast Sanjay on his head severely with a metal rod. Sanjay survives the blow, but acquires anterograde amnesia because of the trauma of his brain injury. At any given time, he does not remember anything that happened more than 15 minutes back, although he frequently has flashbacks of Kalpana's murder. He determines to take revenge on those responsible for Kalpana's death. The rest of the story is a fierce revenge drama,about how Sanjay, along with a medical college student Sunita (Jiah Khan), goes about finding Lakshman and the goons.